Additional Info: Turkey is an extremely mountainous; Mount Ararat is a snow-capped inactive volcano, which rises above the surrounding plains. It is said to have been the resting place for Noah’s Ark. The European section of Turkey, in the northwest, is Eastern Thrace, and forms the borders of Turkey with Greece and Bulgaria. The Asian part of the country, Anatolia, consists of a high central plateau with narrow coastal plains, between the Koroglu and East-Black Sea mountain range to the north and the Taurus Mountains to the south. Eastern Turkey has a more mountainous landscape, and is home to the sources of rivers such as the Euphrates, Tigris and Aras, and contains Lake Van and Mount Ararat, Turkey's highest point at 5,165m (16,945 ft). Rising from all four directions, mountains encircle the peninsula of Anatolia. A part of the Alpine-Himalayan Mountain range, Turkey has mountainous regions with different geological formations. The North Anatolian range skirts the Mediterranean shore. Mount Ararat is the tallest peak in Turkey. This snow-capped, dormant volcanic cone is located in the IgdÄ±r Province, near the northeast corner of Turkey, 10 miles west of the Iranian and 20 miles south of the Armenian border. The climb is long, but there is a fairly easy route from the south in late summer for climbers who are familiar with the use of axe and crampons. Snow covers the last 400m (1/4 mile) year-round. There are two possible campsites on the mountain, and the glacier begins around 4,800m (15,750 ft). The Turkish government requires a climbing permit and use of a certified Turkish guide. Arrangements can take two months to complete. Kackar Mountains are a mountain range rising along the Black Sea coast in Eastern Turkey. With highest peak Kackar DagÄ± (elevation 3937m), and mountain plateaus at about 3000m in elevation, it is the highest part of the Pontic Mountains. The Kackars are glaciated mountains, alpine in character, with steep rocky peaks and numerous mountain lakes. Mount Erciyes is a massive stratovolcano located 15 miles south of Kayseri, Turkey. Erciyes is the highest mountain in central Anatolia (3,916m). The volcano is heavily eroded, but may have erupted as recently as 253 BC as possible depicted on Roman era coins. Mount Ida is a mountain in northwestern Turkey, southeast of the ruins of Troy, along the north coast of the Gulf of Edremit. The name, Mount Ida, is the ancient one. The mountain is the scene of several mythic events in the works of Homer. At its summit, the Olympian gods gathered to watch the progress of the epic fight. But the mountain was the sacred place of the Goddess, and Hera's powers were so magnified on Mount Ida, that she was able to distract Zeus with her seductions, just long enough to permit the climactic taking of Troy. Additionally, an interesting site is AnÄ±tkabir, located on an imposing hill, in the AnÄ±ttepe quarter of the city, where the mausoleum of Mustafa Kemal Ataturk, founder of the Republic of Turkey, stands. There is a growing number of hiking and trekking trails in Turkey. The Lycian Way is a long-distance footpath here in Turkey, researched by Kate Clow (British). It is 310 miles long and stretches from Fethiye to Antalya, around part of the coast of ancient Lycia. It is waymarked with red and white stripes, the Grande Randonnee convention. The Sunday Times has listed it as one of the world's top ten walks. The marked trail wanders up and down through ancient Lycia, Mediterranean Turkey's mountainous Tekke Peninsula (the southward "bulge" of land between Antalya and Fethiye). The Saint Paul Trail is another way-marked long-distance footpath, approximately 310 miles long. The trail goes from Perge, east of Antalya, to YalvaÃ§, Isparta, northeast of Lake Egirdir, with a second branch from at Aspendos, east of Antalya that joins the main route at the antiq site Adada. This trail partly follows the route of Saint Paul on his first journey to Anatolia. It starts at sea level and climbs to 7,200ft in elevation. The Cappadocia region is largely underlain by sedimentary rocks formed in lakes and streams, and ignimbrite deposits erupted from ancient volcanoes approximately 9 to 3 million years ago. The Bible's New Testament tells of Cappadocia, but in fact this part of Central Anatolia has been important since Hittite times, long before the time of Jesus. 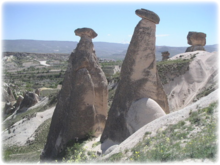 It is Turkey's most visually striking region, especially the "moonscape" area around the towns of Urgup, Goreme, Uchisar, Avanos and Mustafapasa (Sinasos), where erosion has formed caves, clefts, "fairy chimneys" and sensuous folds in the soft volcanic rock. One of the best day excursions in Cappadocia is the underground cities, (Kaymakli or Derinkuyu), the former Ottoman-Greek town of Guzelyurt, the dramatic Ihlara Valley with its dozens of painted Byzantine churches, and the Agzikarahan Seljuk Turkish caravanserai on the Silk Road east of Aksaray. You can spend two to four or even five hours hiking in the valley. If you have a car and driver, the driver can drop you at Ihlara Village, the Ihlara Valley visitor's center, or Belisirma village, you can hike, and the driver can pick you up at another of these points. Both cross-country and mountain biking are growing in popularity here. Road conditions are now always the best but there are many beautiful scenes to enjoy. As mentioned in the hiking section, Cappadocia is a beautiful and unique spot - also great for cyclists. Cycle with a group and discover the rock-cut churches of Ihlara (carved in the Byzantine era by early Christians) and the fairy chimneys and underground cities of Kaymakl. Enjoy cycling form village to village staying in small family-run pensions and lots to see. If cycling without a guide, look for the Village-to-Village Turkey Road Atlas, which covers the entire country in more than 200 maps. It's available from many of the better bookshops in Turkey. Turkey is truly where East meets West and it is precisely this mixture that makes travel in Turkey so interesting. In addition to the historic structures displayed at the main archaeological sites such as Assos, Troy, Pergamon, Ephesus, Myra, Olympus, Chimeira, Zeugma and Aspendos, many coastal villages and towns are blessed with their very own Anatolian ruins on the outskirts. Troy is a legendary city and center of the Trojan War, as described in the Epic Cycle, and especially in the Iliad, one of the two epic poems attributed to Homer. 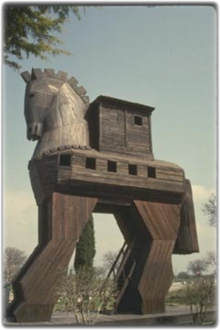 Trojan refers to the inhabitants and culture of Troy. Today it is the name of an archaeological site, the traditional location of Homeric Troy, Turkish Truva, in HisarlÄ±k in Anatolia, close to the seacoast in what is now Canakkale province in northwest Turkey, southwest of the Dardanelles under Mount Ida. Today there is a Turkish town called Truva in the vicinity of the archaeological site, but this town has grown up recently to service the tourist trade. The archaeological site is officially called Troia by the Turkish government and appears as such on many maps. Ankara is the capital of Turkey and the country's second largest city after Istanbul. While visiting the capital, visit the Temple of Augustus and Rome: The temple was built between 25 BCE to 20 BCE following the conquest of Central Anatolia by the Roman Empire and the formation of the Roman province of Galatia, with Ancyra (modern Ankara) as its administrative capital. The temple, on the ancient Acropolis of Ancyra, was enlarged by the Romans in the 2nd century. In the 5th century it was converted into a church by the Byzantines. 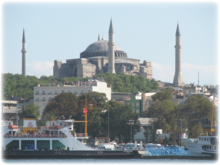 It is located in the Ulus quarter of the city. » Serpent column - One of the oldest monuments, located at the Hippodrome in the Sultanahmet quarter is the Serpent column - an ancient Greek sacrificial tripod, originally located in Delphi and later relocated to Constantinople (modern Istanbul) by Constantine I in 324. » Maiden's Tower sits on a small islet located in the Bosphorus strait off the coast. It was first built by the ancient Athenian general Alcibiades in 408 BC to control the movements of the Persian ships in the Bosphorus strait. » The Column of Constantine is a monumental column ordered by the Roman emperor Constantine the Great in 324 and inaugurated in 330 for marking the declaration of the new capital city of the Roman Empire, Byzantium, which Constantine renamed as Nova Roma, but eventually became known as Constantinople (today Istanbul) after Constantine's death in 337. » Hagia Sophia: The early Byzantine architecture followed the classical Roman model of domes and arches, but further improved these architectural concepts, as evidenced with the Hagia Sophia which was designed by Isidorus and Anthemius as the third church to rise on this location, between 532 and 537. 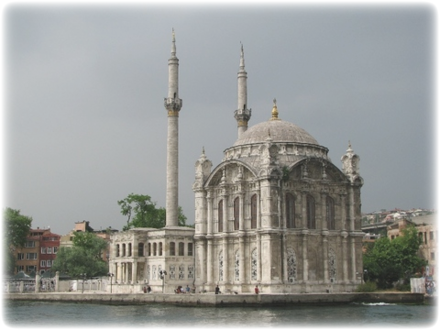 It is a former patriarchal basilica, later a mosque, now a museum. Famous in particular for its massive dome, it is considered the epitome of Byzantine architecture. It was the largest cathedral in the world for nearly a thousand years, until the completion of the Medieval Seville Cathedral in 1520. Also check out Hagia Irene. 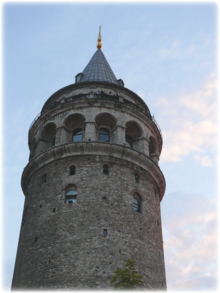 » The Galata Tower is to the north of the Golden Horn. One of the city's most striking landmarks, it is a huge, cone-capped cylinder that dominates the skyline on the Galata side of the Golden Horn (the inlet of the Bosphorus dividing the city of Istanbul and forming a natural harbor). There is a restaurant and cafÃ© on its upper floors which commands a magnificent view of Istanbul and the Bosphorus. Also located on the upper floors is a nightclub which hosts a Turkish show. » The Dolmabahce Palace is located at the European side of the Bosphorus. The palace served as the main administrative center of the Ottoman Empire from 1853 to 1922. Dolmabahce Palace was the first European-style palace in Istanbul and was built by Sultan Abdulmecid between 1842 and 1853, at a cost of five million Ottoman gold pounds, the equivalent of 35 tons of gold.